We love animals and aren’t afraid to show it! The Companion Animal Clinic team takes animal health and well-being seriously. We recognize that every patient is different, and we tailor our recommendations to your pet’s lifestyle. High quality veterinary medicine is our emphasis every day. Our doctors stay current with attending numerous continuing education conferences and bring back that new information to benefit your pet. We routinely perform a variety of diagnostic tests to give us the answers we need to best treat our patients. We have the knowledge to treat complex medical conditions, and offer hospitalization for patients that need more extensive care. 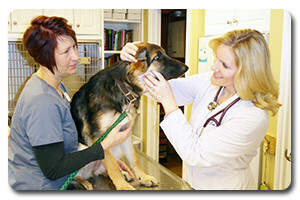 From wellness exams with vaccination to treating sick patients, we do it all. We have a variety of supplements, specialty diets, and products that promote health and wellness. Our large pharmacy also has many heartworm, intestinal parasite and flea and tick preventative options, as well as most pharmaceutical drugs and nutriceuticals (natural products) to allow us offer the best treatment options. Client education is also a top goal. We don’t just want to satisfy, we want to impress you with our customer and patient care!